I posted last week on the new Instagram page (@motheringwithcreativity) a picture of my 9-year old finishing her first Outschool class. She did a canvas art painting class, absolutely loved it, and has been begging to do another one ever since. Now that we have just completed our 5th class, I figured I'd share a little about it because I LOOOOOVE it so much (we've now done art, chemistry, animal classifications, and car engines). Today, my 7 year old took a course on the basics of car/truck engines. This little one is currently my most difficult child to homeschool. He is so hands on, doesn't particularly love reading, and loves anything engineering related...something with which I am relatively unfamiliar. I was FLOORED when he finished his hour long course and came out to explain the purpose and function of the four different cylinders in a car engine. WHAT?!?! I honestly wasn't sure whether or not he'd leave that hour of sitting/listening to this teacher speak and love or hate it, so this was a complete surprise. He can't EVER sit still, and yet he sat, listened, and understood a subject that, to him, was the coolest ever. I am so sold on Outschool. There are an abundance of classes offered, and many different teachers to learn from. The cost is (in my opinion) very reasonable, and there is a good mix of one-time classes, month long classes, and semester classes. 1) Give my children a little something outside of our usual school routine. 2) Allow my children to explore their interests with someone who is more knowledgable than I. 3) Allow me to have a little bit of time where one or two children are occupied and I can more specifically work on school with the others. 4) Science. I'm not great at it and I don't love it. I'm always looking for fun people to teach my children science! 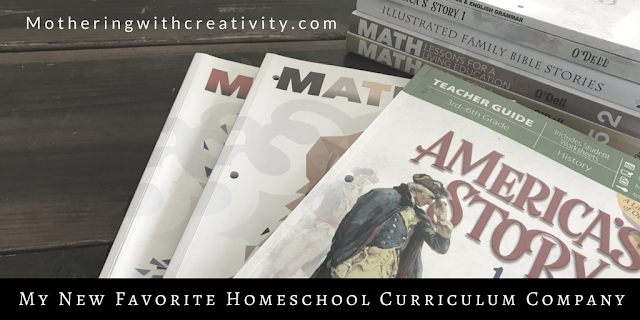 While many of the classes are during the day, there are also evening and weekend classes, meaning non-homeschoolers can certainly take advantage of these classes, too! Have you tried Outschool? What were your thoughts? Any favorite classes? 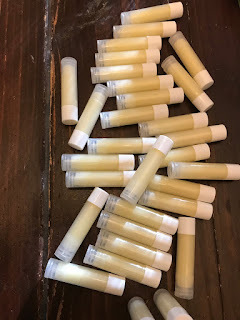 If you are interested in trying out a class, use THIS LINK to get $20 towards your first class (and I will get $20 too!)! Let me know what you try! I posted this week on the BRAND NEW INSTAGRAM PAGE (say what?!?... 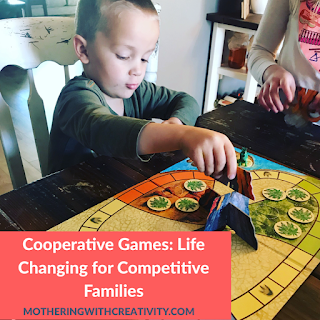 @motheringwithcreativity) about how much we love this cooperative game-Dinosaur Escape. We have a competitive family, but we all LOVE board games. This one has been amazing because either everyone wins, or everyone loses. The bickering is significantly less, and the kids will often play 3-4 rounds before moving on to something else. I had no idea that Peaceable Kingdom offered so many of these games, so now I'm hunting down the rest on Amazon. I've heard great personal reviews on several of these games from friends, so I'm really excited to grab a couple more for Christmas this year. Dinosaur Escape is great because A) my 5 year old currently loves dinosaurs, and B) because it takes practically 5 minutes to play, has minimal set up, and no reading required. Even my big kids (7, 9, 11) jump in on this one! If you're looking for a great gift for Christmas, check out all the Peaceable Kingdom games on Amazon. For some reason, Dinosaur Escape is not currently available on Amazon, but it looks like there are a ton of other ones! Once upon a time, I had four children under age six. My husband got off work at 5:00, and was home exactly 5 minutes later. The table would be set, the smell of delicious hot food would fill the air, and we would sit down by 5:15 to eat a hot, homemade meal. Then the kids got older. And they jumped into sports and activities. And the priority of family dinners got shuffled around a bit. At my core, though, I really valued that family time around the table. 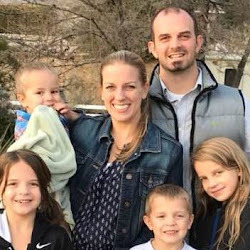 It is something that I placed a high priority on, and something that I wanted in our lives even with the addition of sports and activities and big kid stuff. I wanted to establish a family meal time when our children were young, so that when they were old, it would still be a regular family "thing". I wanted my children to have a place where questions and conversations were natural and welcome. Sports and activities were throwing a wrench into my plans. What took me a while to consider was that the priority was on a family meal time, not necessarily a family dinner time. Who said that meal had to be dinner? We began utilizing family breakfast or lunch times. Lunch was more natural for me as breakfast meant I had to be up extra early (uh, not happening). Our life has been a little more full lately. We spend a lot of our time at our martial arts gym training and teaching. All four of our children, plus my husband and I take classes, putting us home later in the evening. We generally do simple meals on our later nights, but it felt so "rushed" as of late, and I really wanted to reclaim some of that family meal time. I hated rushing home, throwing food on the table, eating, and sending them off to bed. Recently, I began to set the table for dinner early in the afternoon, before we even leave for our evening classes. A cute centerpiece, candles, dishes and cutlery, etc. Just the simple act of preparing an otherwise plain table began to draw my children to the kitchen. When we come home from the gym, we kicked our "watch tv or play until mom's done prepping dinner" habit in favor of a "sit around the table and talk together" routine. Our kitchen and dining table are connected, making it easy for me to prep food and talk with the family. I put the finishing touches and prep on dinner, my family sits at the table or helps out, and we enjoy the time together while dinner is getting ready. This one tiny little change has given us an easy extra two hours or more of family time a week. Our dinners have been more enjoyable, our kids are staying at the table longer, and the conversations have been more relaxed. The stress of getting home late and eating quickly has mostly diminished, and we are once again enjoying our family dinners together. It seems like something so silly and simple. And it is. But silly and simple solutions that yield positive family time are my kinda solutions. If you are in a similar phase of life with activities or evening things that may be threatening your family meal time, I highly encourage you to think outside of the box. Is there another meal time that would work for your family? Is there a way to spend more time in the kitchen or around the table together? Dinner isn't the only opportunity for time around the table with your family. If it's a priority to you, get creative and make it happen! 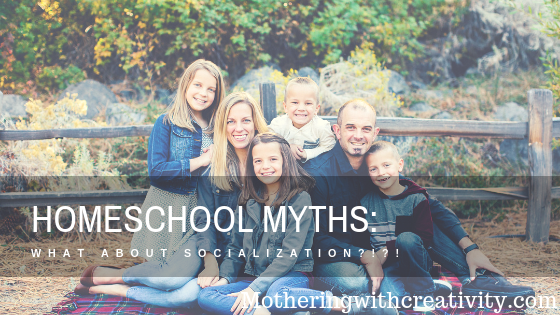 Homeschool Myths: What About Socialization?!?! Before I started homeschooling my children, my biggest reluctance with it was the fear of them being socially awkward. 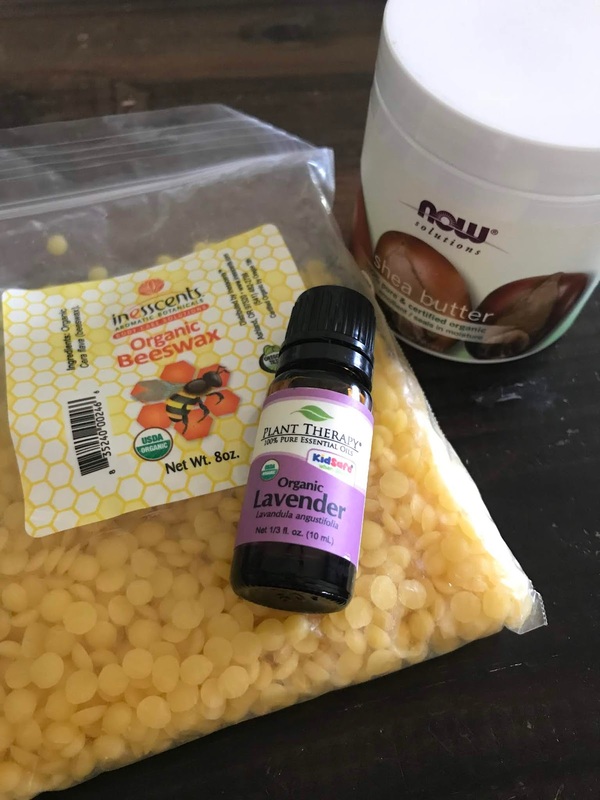 After all, most of the homeschoolers I had known or had met up until that time had fit the stereotypical homeschool standard of being a bit "weird" or "off" when it came to social skills. Seven years into this homeschooling gig, and I am nearly at a spot where I would almost argue the opposite. Homeschooling is a very social way to educate children, and even more, I think it's a more natural way to do so. The first time we showed up to a homeschool picnic with a bunch of people we didn't know, I was shocked at how children of all ages played together. Big kids grabbed little kids, asked their parents permission to bring them along with the group (I'd never heard kids talk to adults with confidence like I observed at this moment), and went off on adventures together around the park. I just remember feeling so inspired by what I saw. Big kids didn't write off the little ones as annoyances, and little kids happily jumped in with the big kids knowing full well they'd be welcomed. My new-to-the-group children were entirely welcomed. It was an eye-opening moment for me. Homeschooling allows for the unique opportunity to engage with people of all ages. While there are a lot of age or grade specific co op classes around our city, there are also many all-ages gatherings, classes, and groups. This offers kids the opportunity to work, collaborate, and engage with kids at different stages of development than their own. I believe that this leads to homeschoolers being more accepting of others who are different than themselves. My kids talk to the mailman, the garbage man, and the neighbors. They go to the store with me. The bank. The DMV. Doctors appointments. And more. They interact regularly throughout the day, primarily, with adults. They're getting to learn social skills from ADULTS, who know much better than children how to interact appropriately (or at least we hope so, right?). Their examples for social behaviors are grown-ups, not 5 and 10 year olds, which (I believe) is a more helpful way of learning to interact in our society appropriately. Now don't get me wrong, they don't only interact with adults...my kids interact with other kids pretty much every day, whether that is during co-ops, field trips, and/or martial arts classes. They have play dates, neighborhood friends and other participate in seasonal sports. We play with friends A LOT. I love the balance that my homeschoolers receive in interacting with kids of all ages and adults, alike. I get told a lot by random adults after they've interacted with my children, "they are so social for homeschoolers!" To which, when I'm in a snarky mood, I sometimes reply, "they're so social because they're homeschoolers!" If you've been considering homeschooling but have had concerns about the social aspect of it, I encourage you to think of all the social benefits to homeschooling. Is it different than the norm? Yes. Is it worth it? Absolutely! 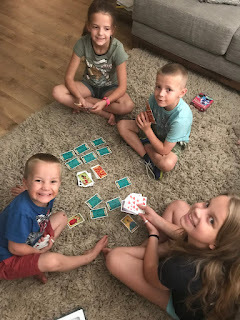 Our homeschool family loves to play games. I love that a good game can not only engage my kids, but teach them math skills, co-operation, reading, and more. We happen to spend a good chunk of our time at our martial arts gym. Between the classes that I teach, the classes that they each take, and the classes that my husband and I take, we are there for a few hours each day. Sometimes they play with the other kids, sometimes they sit and veg out on iPads, and a lot of times they bring games to play together and with their friends. I'm always looking for simple but fun games that my kids can play on their own easily. 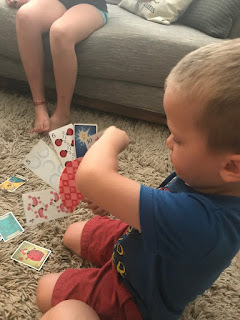 Games that are easy to teach and are easy/quick to learn are the BEST! (If you have any that you love, I'd love to hear about them, too.) I figured since we've got a few good ones at the moment, we'd share with all of you! 1. Snappy Dressers. I love any game that I can throw in my purse and bring with me on the go. This is one of those games. 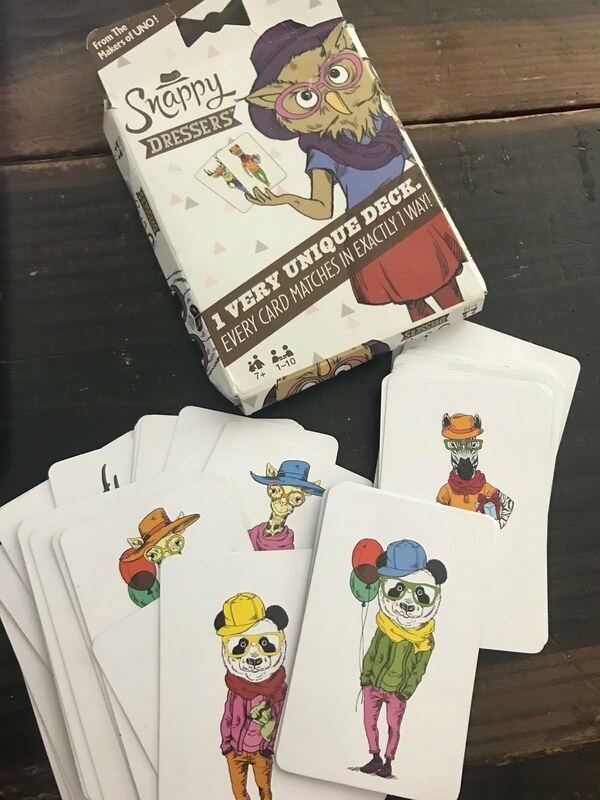 This is a fast-paced card game that anyone can learn and play quickly. While there are at least 9 different ways to play this game, we generally stick to the first option. Every card in the deck matches every other card in the deck in exactly ONE way. You have to spot the matching item on the card (hat color, scarf, top, bottoms, shoes, gift, or animal) to lay it down in the discard pile. First person to get rid of all their cards wins. 2. Sleeping Queens. My sister in law, Jenny, gave us this game for a birthday once, and it quickly became a favorite. 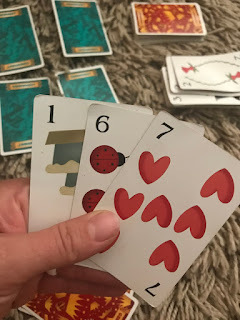 Not only is it fun to play and won several game awards, it also incorporates matching, addition and subtraction, and silly character cards. 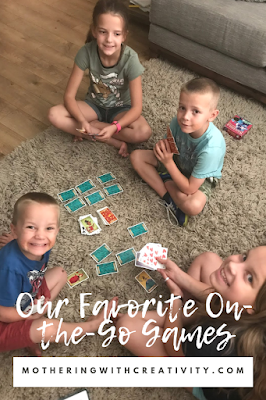 My kids have taught many of their friends to play, and it quickly becomes a favorite for most. We've played it with numerous 4 year olds, as well as up to big kids (10-12's). 3. Mancala. This isn't a new game, for sure, but it's a fun one that we recently rediscovered. After purchasing this game and realizing that I played differently than the instructions in our game box, I took to the internet for the rules. And guess what? It turned into a whole history lesson as we explored the oldest game ever known! It originates in ancient Egypt, and there are over 600 variations of the game/ways to play. There are a variety of board shapes, styles, and rules. So if you play this game with others who already know it, be sure to clarify how you plan to play! You may find that you play by different rules. Side note: My 4 year old manipulating the little beads in his hand is the absolute cutest thing ever. He loves playing this game with his 4 year old buddy from martial arts while their big siblings are all in their classes. So cute. 4. Nerts/Group Solitaire. You know the age-old game of solitaire we used to play on our computers as kids? 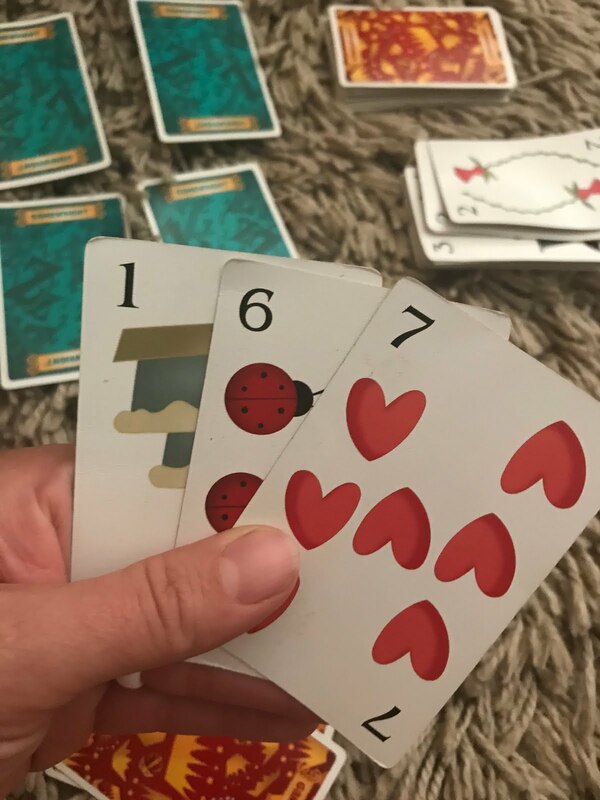 Did you know you can play group solitaire? To play: Everyone needs their own deck of cards. 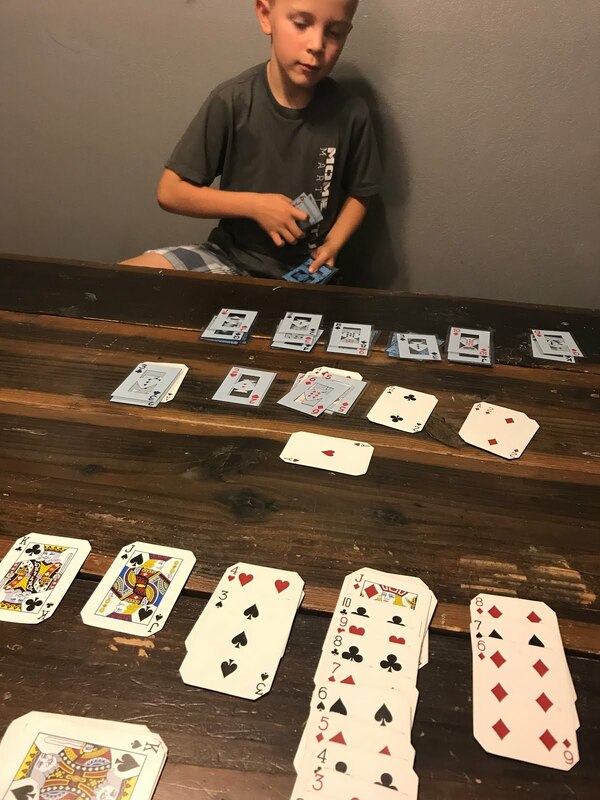 Set up your seven piles just like normal solitaire (first pile is face up, then six face down piles; move to the second pile and place one face up, then the other five piles face down...continue until all seven piles have a face-up card on them). Everything is the same in group solitaire EXCEPT that ANYONE can play off of the center Ace cards. 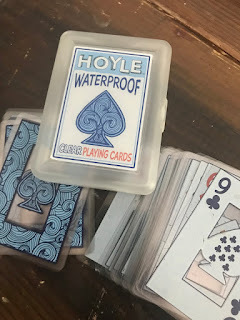 This is an interesting one because although you are trying to beat each other, if one player doesn't uncover all their cards, you might both lose. SO, there is a little bit of team work, too. My 7, 9, and 10 year olds have all been working really hard to get good at this game, and it's become really fun to play with them. 5. Labyrinth. We've had this game for a couple years now, and it is still a favorite. A portion of the squares on the game board are stationary, the rest are movable. Each player draws a card to find a treasure. They then have to get through the labyrinth and to the treasure in as few of turns as possible. You only get to push one square on each turn. The first person to get to five treasures wins. 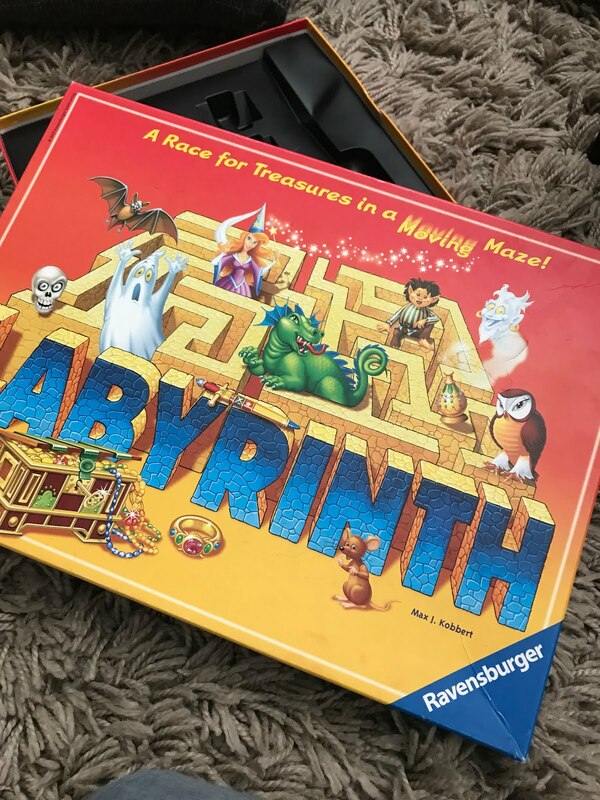 The labyrinth is always changing, making it a fun challenge to set up moves for your next turn. 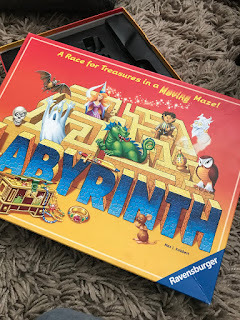 Even the little ones simply enjoy changing up the labyrinth on their turn. 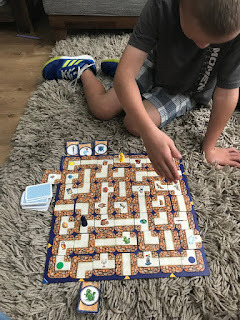 This game is most-loved by my little 7-year-old engineer brained child, who can *almost* always get himself to the treasure on his first try. This is a decently quick game, easy and quick to set up, and great for all ages...even adults. 6. While not a game, I wanted to mention this neat little tool that allows our youngest kiddo to jump into card games with the rest of us. My friend Ginny gifted this to my Levi, and it has gotten more than its fair share of use. This card holder allows little hands to grab on and stick their cards across so they can see their cards and play. He uses it every time we play Sleeping Queens. What are your favorite games to play with your family/friends? 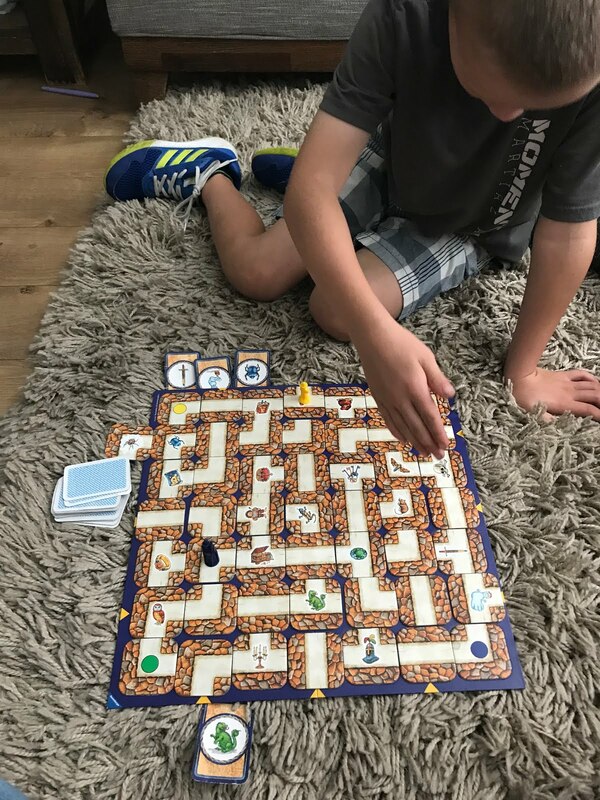 I'm especially looking for more games like these that can go with us anywhere, are easy to teach, quick to play, and fun for kids of all ages. 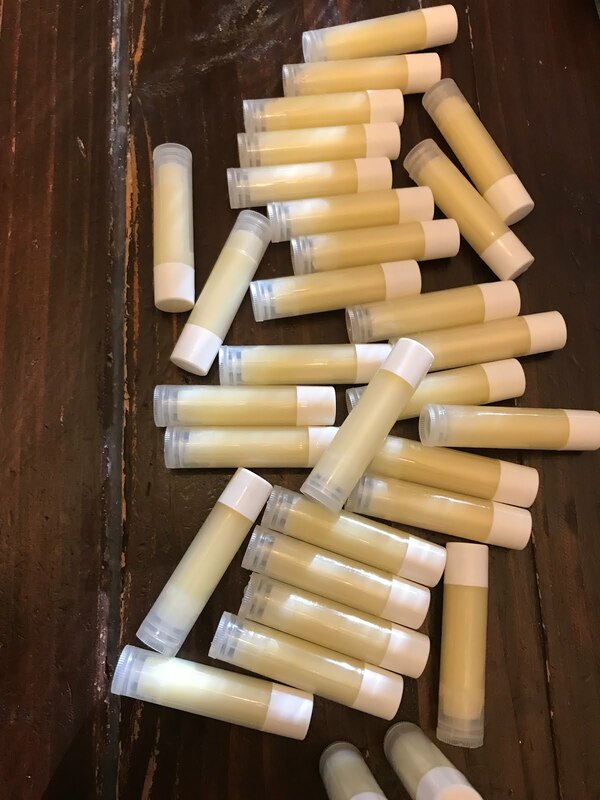 Leave your ideas/suggestions in the comments!